Only in wartime could a stalwart lass from Manchester rub shoulders with a Scottish aristocrat, one a pilot, the other a special operations executive. Yet whenever their paths cross, they complement each other perfectly and before long become devoted to each other. But then a vital mission goes wrong, and one of the friends has to bail out of a faulty plane over France. She is captured by the Gestapo and becomes a prisoner of war. The story begins in Verity's own words, as she writes her account for her captors. Truth or lies? Honour or betrayal? Everything they've ever believed in is put to the test. Oct. 11th, 1943 - A British spy plane crashes in Nazi-occupied France. Its pilot and passenger are best friends. One of the girls has a chance at survival. The other has lost the game before its barely begun. As she intricately weaves her confession, Verity uncovers her past, how she became friends with the pilot Maddie, and why she left Maddie in the wrecked fuselage of their plane. One each new scrap of paper, Verity battles for her life, confronting her views on courage and failure and her desperate hope to make it home. But will trading her secrets be enough to save her from the enemy? OK, I need to rely on the publisher's blurbs to help me not give away too much of this most wonderful of stories. I finished reading Code Name Verity at 2 o'clock in the morning because I couldn't put it down. When I woke up a few hours later, I picked it up and began reading it all over again. It is just that powerful. Simply put, it is a story about the friendship between two young women during the Second World War. Maddie, a commoner who is also a gifted mechanic and whose love affair with flying began on an ordinary Sunday while out with her then best school friend Beryl. The two girls had gone for a picnic tea on Maddie's motorbike, a Silent Superb, when a plane crash landed in a field not far away from them and, after rescuing the pilot, another young woman, Maddie knew that she too wanted to fly. And so she became a gifted pilot and airplane mechanic, became part of the ATA program (Air Transport Auxiliary) ferrying planes around England and doing her bit for the war effort. Verity is a well-bred, well-educated Scottish girl who grew up in a castle, went to school in Switzerland, speaks fluent German and who is doing her bit for the war effort as a British spy. They would be unlikely friends under normal conditions, but war makes for strange bedfellows and it didn't take long for Verity and Maddie to realize they "make a sensational team. The story is told in two parts. Part One is Verity's version of the events leading up to her friendship with Maddie and how they ended flying together to Nazi occupied France. Now in the hands of the Gestapo, and at their mercy, Verity is providing them with what they want - information about England's airfields, wireless codes and any other information they believe will help them conquer the British. Part Two is not told from Verity's point of view. And in order to avoid spoilers, I shall leave it at that. Needless to say, Code Name Verity is one of the best books I have read in a long time, best not just because it it a good story, but because it kept me guessing and questioning for just long enough. And I love a good unreliable narrator and Verity is one of the most delicious of these, spinning out her tales like Scheherazade to buy more time and playing a game with her cruel German literature loving Gestapo captor SS Hauptsturmführer von Linden. Bravos to Elizabeth Wein for crafting such a wonderful story. She has clearly done her WWII research for Code Name Verity and it is apparent throughout the entire book with rich details woven into the the story. And it is mesmerizing, the whole book holding you in its grip wanting the next part of Verity's narrative. When I came to the end of Code Name Verity the first time I read it, and it all came together and made sense, the only thing I could do was shake my head and say out loud "Elizabeth Wein, you are wizard, utterly brilliant." 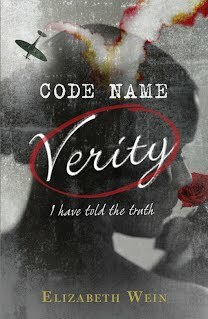 In fact, Elizabeth Wein wrote an article on how she researched Code Name Verity which you can read here. Or visit her on her website E Wein and be sure to look at some of her wonderful WWII knitting. Yes, I did like this a lot. I don't usually reread a book so quickly but I couldn't resist. I thought the article on research was very interesting. I am always interested in discovering how people go about researching historical fiction. Glad to hear it's one of the best books you've read in awhile. My husband just bought me this one, and I can't wait until our camping trip for me to have some uninterrupted (I hope!) reading time. Oh, I hope you enjoy it as much as I did. What a nice husband you have. When is the camping trip? Soon? I hope you have a great time. This sounds like a really good one -- putting it on my list, thanks! Code Name Verity is indeed a really good book and I hope you really enjoy it as much as I did. It is most unusual. Glad to hear you liked Code Name Verity. When I read the blurb I knew it would be something I'd be interested in. Yes, I think you might really like Code Name Verity. It is interesting and different. This book is a wonderful historical fiction about WWII told from a different perspective. There are lots of Holocaust books. There are books about soldiers fighting the war. There are books about almost every aspect of the war. Very rarely do you read about women during the war, and almost never about young women actually fighting in the war! Fighting! Not being nurses, not working at home, not struggling to survive while their towns are being blown up. Actually flying into the middle of it! Add to that the prisoner of war aspect and wow! Have you heard that the author's got a new book coming out in September? It's also set in WWII and is called Rose Under Fire. Thanks, Joy, I really appreciate that. Yes, I did hear about Elizabeth Wein's new book and can't wait to read it.